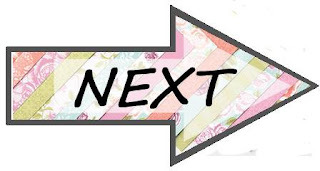 So this month on our Inspire, Create, Share Blog Hop we are celebrating "girls" with "It's a Girlie Thing"!! Mother's Day is really right around the corner-although here in New England it feels like Christmas is coming! Nasty winter weather continues. So I'm happy to share this card with ya to help me think "spring"!!! 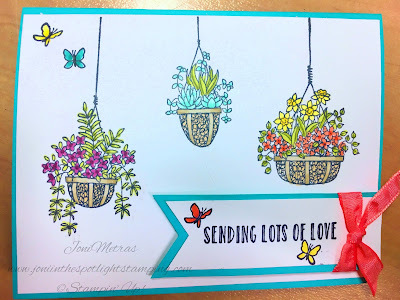 So this was created with the oh-so-beautiful Hanging Garden stamp set!!! I so love it!!!! I've already used it so many times!!!! But I thought this one was a pretty "girlie" kinda card! This black-line stamp set is perfect to feature our amazing new Blendabilities found for the first time in our Spring Occasions Catalog!! Unfortunately, they are all on backorder right now, but they will surely become available soon as they will be available in the brand new Annual Catalog beginning June 1!!!! As a demonstrator, I get a sneak peek at the new catty at our On Stage conference this coming Saturday! So excited! Anyway, the Blendabilities are the perfect blending/coloring tools! Brush on one end, fine tip on the other! They come in 2-color pairings-1 light & 1 dark!!! So pretty!!! Oh, and did I say super easy to use?! Just stamp the image with the Memento Ink stamp pad & color away!!!! Wink of Stella to give it a bit of bling, but it never seems to show up in photos!!! Now hop on over to Megan's blog & enjoy her creation-then keep going for some more beauties! Just click on her name or the icon below! Thanks for joining us this month! Pretty colors! Trying to think Spring here in the US too. How sweet! See you got your blog fixed too! Thanks for hopping with us! Your card is so cheerful. I'm looking forward to spring at some point!! Beautiful card, Joni! Just love the bright colors! Cute! Nice job on the coloring too! Joni, this card is so cute! I love the colors you used. 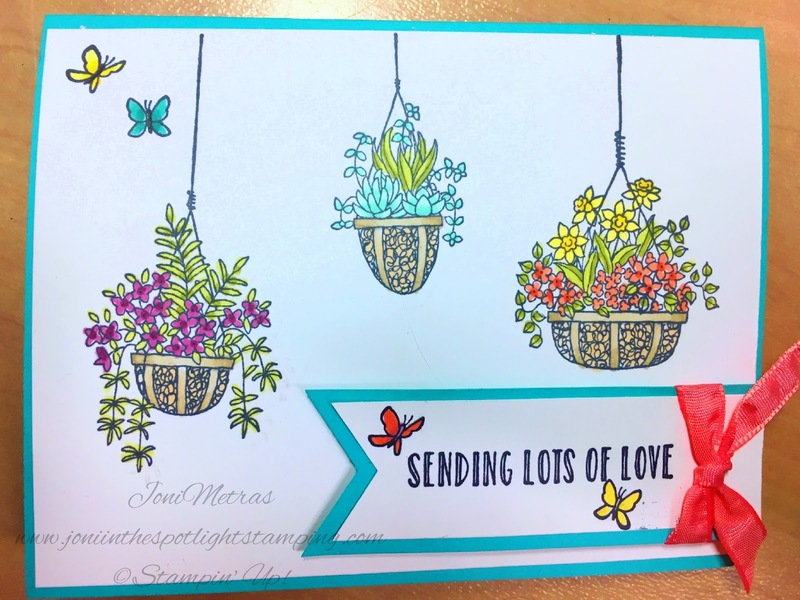 I love the springy colors you used on your pretty card!